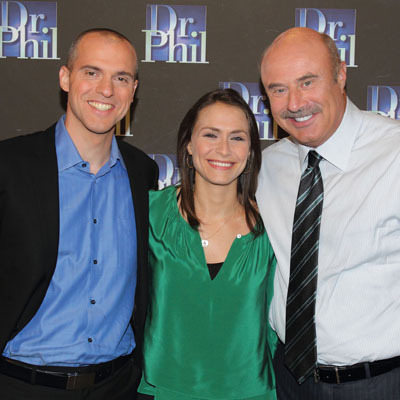 The husband-and-wife team of marriage coaches, Will Craig ’96 (left) and Laurie Gerber ’96 (center), made TV appearances with Dr. Phil McGraw twice this fall. Sophomore year, 1993, Will Craig ’96 and I met in an education class. We married five years later in the amphitheater. Less than 10 years into our marriage, we lived in Manhattan with two toddlers. I was running a tutoring company, and Will was running a home day care while trying to renovate a townhouse we’d just gone out on a very thin limb to purchase, after the contractor had mysteriously disappeared. We were also having trouble selling the home we lived in to create the cash for the new one. We were pushed to the limits of our love. Even before all those stressors, we had settled into a practical, rather passionless routine. So when the going got tough, I blamed Will. I didn’t think of him as my teammate; I thought of him as an incompetent customer-service agent and, at times, an opponent. I was not nice. Enter the Handel Group, the corporate consulting and life-coaching company I had originally hired to help me figure out how to grow my business and change careers. Now I severely needed help with my marriage, and I got it. At the urging of Lauren Zander, inventor of the Handel Method, I sat down with Will one afternoon and told him I had a dream of achieving deep intimacy in our relationship and asked him to tell me why we didn’t have it. I worked hard to make him feel safe enough to reveal the truth. He told me that I almost always interrupted him and that it was akin to a physical assault. He told me he had stopped trying to talk to me years ago, that my interruptions were usually about my own anxieties, not about his reason for talking with me, and that left him feeling totally disrespected. Whoa. Maybe for the first time, I actually listened and let his experience sink in. I flashed to memories of my parents and brother pointing out my selfishness and other conversations I had derailed to serve my agenda. I was mortified by my behavior for the first time, realizing I hadn’t listened to the feedback others had given me for years. I told Will I would stop interrupting him. Pivotal to the Handel Method is learning to make and keep promises. And I worked hard to keep mine. The more I listened to Will, the more he talked. The more he talked, the more I wanted to listen. Turns out he had many wise and interesting things to say, which I had been sadly missing. It was a great reawakening for us, stimulating the intimate connection I’d long desired. Many years later, I still have to keep the “no interrupting” promise in the forefront of my mind. How? I have a made-up consequence to go with my promise. If I interrupt Will, I have to do an extra household chore. I rarely forget to listen, because I hate chores! Of course, Will had his own work to do—learning to declare his needs, not “martyring” himself by staying silent. Together, we’ve decided to bring our best selves to our marriage and have become the passionate partners we, and most people, fantasize about being. The keys: dreaming, listening, telling the truth, admitting our “bad traits,” and connecting them to promises and consequences. 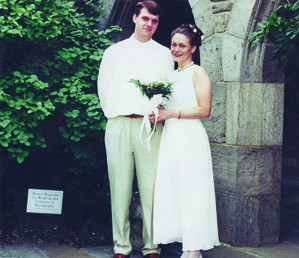 Laurie and Will celebrated Independence Day in 1998 by getting married at the College. Will and I had always been teachers and learners. Through the years, in our careers, we found that what we most wanted to teach were the methods that helped us the most. We both frequently worked with parents and other adults to serve their children’s academic needs but wanted to help on a more emotional level. I used the Handel Method to explore my career options and realized that what I really wanted was to teach in the program. Will joined Handel shortly after, having wrapped up the in-home preschool he had started. We started as practitioners of the techniques we learned from Handel, but Will and I are now both executives with the company. The principle of personal integrity that we now teach in companies and organizations all over the world, including MIT, Stanford, and New York University, demonstrates that we can align our highest ideals, thoughts, plans, and actions through a system of promises and consequences. It’s simple, but startlingly effective. We used it to save our marriage. We have come to believe there is no more sacred work than the work of love—not love as a concept but as a verb, which we describe as caring about the other person’s experience as much as you do your own. This is the skill we most want our children to have and that we want to continue to hone forever. The “love-ability” we learned through the Handel Method cemented our desire to teach its tools to others. Since 2010, we’ve been working with couples, in addition to coaching corporate executives and individuals around the world. Sometimes we save marriages, and sometimes we help people amicably break up, but we always teach love as a verb. In 2013, Dr. Phil invited us to be the coaches on The Marriage Test, an A&E show he produced. We helped four couples decide if their marriages could be saved. He then brought us on as experts on The Dr. Phil Show. We’ve also written for many publications, including The Huffington Post. Will and I have just celebrated 20 years together and 15 years of marriage. That said, we are still at the beginning of our adventure, still proving that marriage can get deeper and hotter over time. Two decades after we met in that Swarthmore education class, we consider our relationship to be very much a platform for learning and teaching. A former special major in political science and educational studies, Laurie Gerber ’96 is an executive vice president and senior coach at Handel Group Life Coaching, a world-renowned coaching company that works with people to design and realize their dreams across all areas of life. Laurie Gerber? and I are supporting the Global Glue Project, which is creating a knowledge base of what makes relationships succeed (we're featured in their KICKSTARTER video twice, in full arts festival gear). Our full film is being presented this Th, 1/16 at the National Arts Club in NYC. https://www.facebook.com/events/1506144919610762/ Please check it out and donate a few dollars if you can't attend. 5 days left to receive the benefit of a Glue Film a week for a year, and help love win!